Tartan by the yard is now available for special order. All 2300+ tartans are available in 100% new wool or blended fabrics. Sold by the yard.This fabric is available in many weights ,suitable for fashions and even upholstery.When placing an order we will verify availability before billing your credit card.You will receive a confirmation e-mail to let you know if the fabric you desire is available in that style.Most fabrics are available in Ancient,Modern,Dress and Weathered tartans. To see the range of tartans available in a given style click on the links below. Please order by full tartan name and number.To calculate shipping charges see the Shipping & Handling page of this site. as being billed from "Gaelicdreams.com" our parent company. The selections below are linked to the tartan lists that show which tartans are available in what weights or fabrics. range, suitable for light clothing and or home fashions. Includes a Teflon coating and is machine washable. range, suitable for light clothing and or home fashions see the list of tartans for availability. 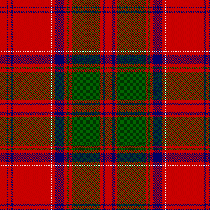 Springweight 8oz 100% wool tartan Available for the top 260 clans. listed may be available at a time as these are done by special mill run. 32 Irish Counties plus the Irish National Tartan. Silk Tartan Fabric by the yard. This is a 9oz fabric that is aproximately 54" wide. for availability and selections.$79.99 per yard. Minimum order one full yard. 100% Cotton Crease Resistant Clothing Velvets, Aproximately 60" wide. Minimum purchase 3 yards per color. Your choice of Black, Dark Navy or Bottle Green. Pitlochry Jacket Tweed, 100% pure new wool. Available in your choice of Lovat Blue or Lovat Green. Please Note: Minimum purchase 2 yards. All tartan fabric is woven in Scotland. 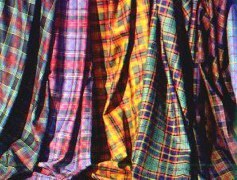 Though we try to maintain a stock of the more popular tartans some styles or weights may take 8-10 weeks for delivery.Discounts are available for purchases of tartan fabric by the yard over $500.00 in value. 8 yards of single width for a traditional kilt. For a preview of the products available see the Tartan Readymade Fashions page of this site.